Getting back your energy after being "stuck in a rut"
Using the Chakra Balancing MP3 couldn't be simpler! Like all our binaural beat recordings, simply slip on your stereo headphones and press the "Play" button on your MP3 player. The binaural beats will automatically begin affecting your brainwaves, and you'll soon realize the benefit - a body and spirit that feel truly unblocked and totally energetic! Your physical body feels tight and cluttered. 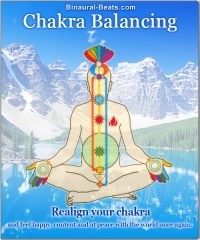 Your Chakra points feel out-of-balance and misaligned. You need a session, a special time to center yourself once more. You know it. And it's so very simple. You just lay back and slip on your headphones. The gentle sounds of rain begin and you start to relax. The sounds are pleasantly familiar. You feel warm... and can feel parts of your body being cleared, being released, being activated. It's a great feeling. All of your seven Chakra points are touched... the Root, the Sacral, the Solar Plexus, the Heart, the Throat, the Third Eye, the Crown. There's no bolt of lightening... but you can sense a deep inner change. Your energies are flowing again... you can already feel a very real difference in your body. Slowly, almost an hour later, the session concludes, leaving you in a great mood. You're totally refreshed and haven't felt this good for some time. You stand up. Suddenly you realize you're holding your body differently... you've been unblocked and it's obvious. Your Chakra points have been balanced. And you feel fantastic! "Extremely refreshing. I now feel so unblocked and totally free! ... My energy has returned. Wish I had found this earlier!" Notes: Begins with 1.45 Hz to stimulate hypothalamus, pituitary and pineal glands, then Shamanic frequency of 4.5 Hz for healing. Recording ends with 33 Hz pyramid frequency and the 7.83 Hz Schumann resonance, "the earth's brainwave". Each chakra point visit lasts five minutes. This MP3 also contains relaxing ocean and bird sounds in addition to the tones.